This is a fun pattern and perfect to use up some limited yardage of knits. I made a 10 in this pattern, I really didn't want it over-sized too much. It was so fast to make and I love the style. Yes, you have been seeing red in my sewing of late. And guess what? You will be seeing more! I have a pair of shorts to blog and a blouse to cut out. 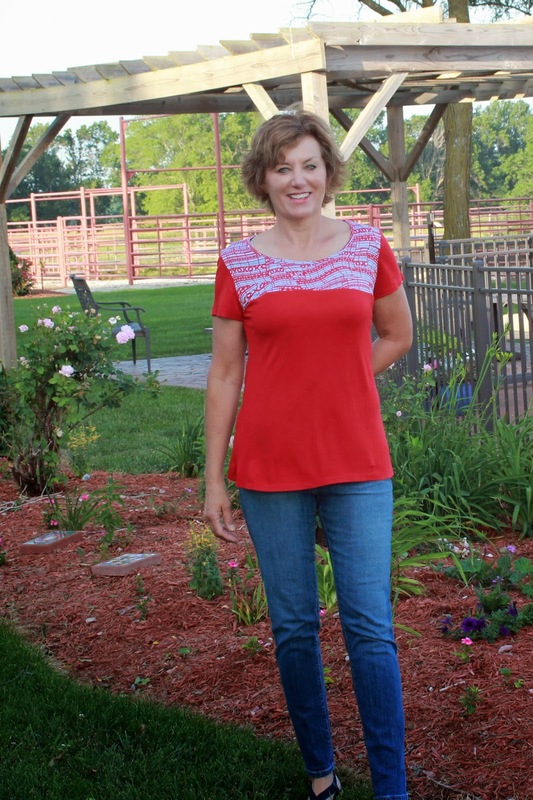 Thanks so much for the comments and advice on my Jorna top, I appreciate all the ideas and advice. I ran out of time and ended up wearing it to the b-b-q as pictured in my blog post. I was truly fine with length and hem curve. Actually, I felt great in my top, it was fun for the event plus cool! Thanks again. I recently bought this pattern and it is great to see such a gorgeous version! Your top looks terrific. Thank you so much, it is a quick one to make but looks great. I agree this top looks lovely. 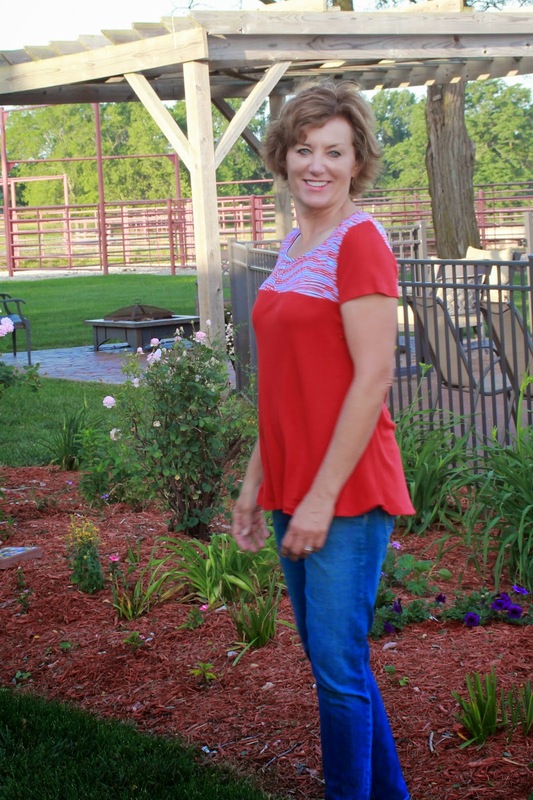 This is a pretty top and I love that you used fabric from the other two tops! You are on a top roll! Thanks, Carolyn, I am on a top roll but I sure needed to be. 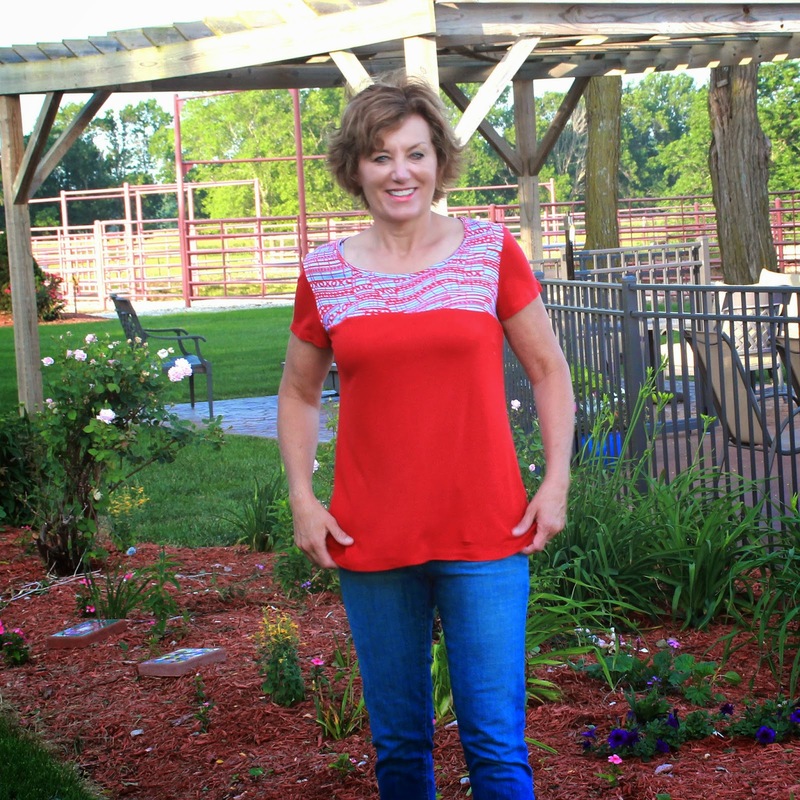 My summer tops usually only last one season, I tend to get something on them or just wear them out! Thanks, so much, it will probably be to a purple dress next, I have only one more red item. You look good in red. Love the shirt. Thank you, Beth, so many compliments on the red, it might be the only color fabric I buy anymore! Great way to use up your fabric. It looks fab! Yes, it does, Patty, I like the shape of it, too. Sometimes I choose my sewing projects based on the color thread in my serger too :-). This is a great top on you and red really suits you. The two fabrics together look lovely! They are such nice fabric, thanks so much. Darling! I love mixing prints too! Thanks, Bunny, the print mixing is so fun. what a cute combo! very clever!! Thanks so much,using up the smaller pieces keeps me from finding room in my shelves, I seem to be getting more fabric as of late! Great mix up of fabric and de-stashing to boot!